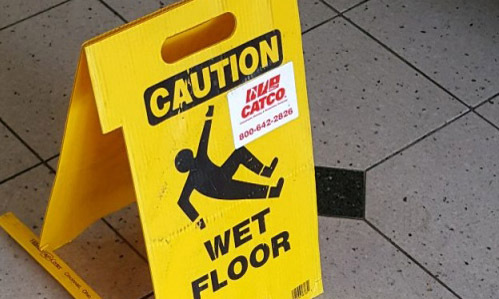 A wet floor sign in the lobby of Guffey Hall the day after the water damage. Guffey Hall was evacuated Thursday evening after a sprinkler head was damaged, causing the fire alarm and sprinkler system to go off, according to an email obtained by Lindenlink. Jeffery Cramer, the supervisor of field operations for maintenance and housekeeping, said that the sprinkler head was damaged by accident when some students were moving furniture inside of a dorm room. Carpet being removed on the second floor of Guffey Hall the day after the water damage. Campus security worked with the fire department and CATCO, a restoration company, to secure the building and clear the water. A second email from Zieger at 10:10 p.m. cleared residents to return to their rooms. “Please be mindful of the cleaning crew and equipment as you make your way in,” the email read. James Schneider, a junior who lives in a third floor room next to the one where the sprinkler was broken, ended up sleeping on a couch in the lobby of Guffey because his room was soaked. He said Lindenwood is trying to find spaces in other dorms for those students who were affected the most. He said there are currently two giant fans and a dehumidifier in his room. Cleaning crews were still present in the building Friday morning. It is not clear how long restoration will take. Attempts to reach the area coordinator’s office and other members of the maintenance staff for comment were not successful. Community advisers were instructed not to comment on the story or share photographs. Lindenlink Sports Editor Matt Hampton, a Guffey resident not directly impacted by the incident, also contributed to this story.